The following outlines the policies for linking to, the use of, or copying information from the El Paso County Web site and protecting the personal information of members of the public who access county department information through the El Paso Web site. Organizations and individuals (the site owner) are encouraged to link to El Paso County information. Advance permission is not required before linking. Links should be made using the appropriate base URL of www.epcounty.com or such other URL as the county department may use. Because departments' sub-pages may change at any time without notice, the site owner should routinely verify links to department sub-pages. Site owners may not capture El Paso County pages within the site owner's frames, present El Paso County Web site content as that of the site owner, otherwise misrepresent the content of the County's department pages or misinform users about the origin or ownership of the content of the El Paso County Web site. Any link to the El Paso County Web site should be a full forward link that passes the client browser to the County site unencumbered. The BACK button should return the visitor to the site owner's site if the visitor wishes to back out. 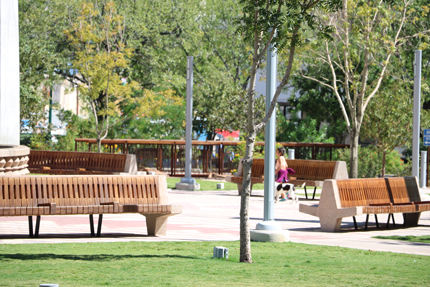 Although the content of the El Paso County Web site is available to the public, certain information on the El Paso County Web site may be trademarked, service marked, or otherwise protected as El Paso County's intellectual property, and all El Paso County content is protected by federal copyright laws. Use of protected intellectual property must be in accordance with federal and state law and must reflect the copyright, trademark, service mark or other intellectual property ownership of El Paso County. "All photographs of the Work which are available or disseminated to the public by the County will contain a credit to Artist containing a copyright notice, Artist's name, and the year of creation in compliance with the Federal Copyright Laws." I've looked at your website policy and think it is adequate. You say they can't claim the picture as their own. And if we add the required copyright notice to the picture we will be covered. Please do that ASAP. Site owners should not link to El Paso County graphics or tables within El Paso County pages, especially in an effort to place the downloading burden on the El Paso County server. Such an action may be considered a misuse of County resources. Site owners should contact the appropriate county department to request permission to use a copy of the department's graphics within the site owner's pages. To protect the intellectual property of El Paso County, copied information must reflect the copyright trademark, service mark or other intellectual property rights of the County, or the County department whose protected information is being used by the site owner. Owners of sites linked to El Paso County pages shall use reasonable efforts to ensure that persons with disabilities may access these sites. The information posted on the El Paso County Web site may be copied so long as it is presented in a non-misleading way and does not imply that either the site owner or the information, as it is presented on the site owner's Web site, is endorsed by the County. Use of the information must identify El Paso County as the source of the information, its web address, the date the information was copied from the County's website by the site owner and must be accompanied by a statement that neither the site owner nor the information, as it is presented on the site owner's Web site, is endorsed by the County or any county department. 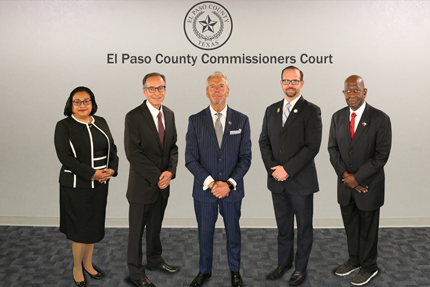 An El Paso County department may not charge a fee to access, use or reproduce information on its Web site or to link to information on its Web site, unless specifically authorized to do so by the Texas Legislature or El Paso County Commissioners Court. To protect the intellectual property of El Paso County, copied information must reflect the copyright, trademark, service mark or other intellectual property rights of the County, or the County department whose protected information is being used by the site owner. A) Under Texas law, Chapter 559, Texas Government Code, unless a state governmental body, other than a state governmental body that is part of the judiciary, is allowed to withhold requested information from an individual pursuant to Chapter 552, Texas Government Code (the Texas Public Information Act), the individual is entitled to be informed about information collected by the state governmental body about that individual. II. what information is being collected through the site about the computer network location or identity of a user of the state governmental body's Internet site, including what information is being collected by means that are not obvious. D) Each non-judiciary state governmental body must establish a reasonable procedure under which individuals may have incorrect information about them that is held by the state governmental body corrected. The correction procedure may not unduly burden the individual seeking to have information corrected. Please send corrections to personal information posted on the El Paso County Web site via e-mail at Contact Us, by phone at (915) 546-2041 or by mailing to El Paso County Webmaster, 500 E. San Antonio Suite 403, El Paso, Texas 79901. E) Each non-judiciary state governmental body shall identify its information collection practices and post that information in its internet site privacy and security policy. The e-mail addresses of members of the public that are provided to El Paso County for electronic communication with County Departments are confidential and may not be disclosed by El Paso County unless the affected member of the public affirmatively consents to the disclosure of his or her e-mail address. A) With the exception of confidential information, information protected by laws designed to protect an individual 's privacy interests, and information not subject to disclosure under the Texas Public Information Act, county departments are encouraged to post information on the Internet, in an accessible format. B) El Paso County may not sell or release the e-mail addresses of members of the public that have been provided to communicate electronically with a government body without the affirmative consent of the affected member of the public.